It’s not too early for a pumpkin recipe. It’s almost the fall, right? Even if we weren’t closing in on the fall, pumpkin knows no seasons for me. Bread – In a large bowl, add the the first ten ingredients, through ground nutmeg, and whisk to combine. Add the flour, baking powder, baking soda, optional salt, and fold with spatula or stir gently with a spoon until just combined; don’t overmix; set aside. Turn about two-thirds of the batter out into the prepared pan, smoothing the top lightly with a spatula and pushing it into corners and sides as necessary; set aside. Cream Cheese Filling – In a large bowl, add all ingredients and whisk to combine. Alternatively, mix with a hand mixer. Top filling with remaining pumpkin batter, smoothing the top very lightly with a spatula as to not disturb cream cheese layer and pushing batter into corners and sides as necessary. Bake for about 48 minutes or until the top is domed, golden, and the center is set, and a toothpick inserted in the center comes out clean, or with a few moist crumbs, but no batter. Note this is tricky because the cream cheese never gets totally solid so the toothpick test isn’t the most accurate. Tip – Tent the pan with a sheet of foil draped over it at the 35 minute-mark if you feel the tops and sides will become too browned before center cooks through. 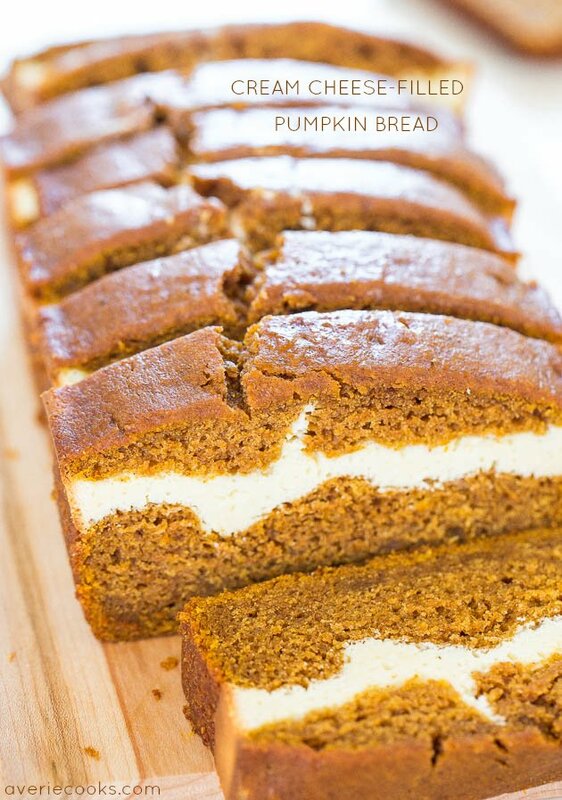 Baking times will vary based on moisture content of pumpkin, cream cheese, climate, and oven variances. Bake until done; watch your bread, not the clock. Allow bread to cool in pan for about 15 minutes before turning out on a wire rack to cool completely before slicing and serving. Optionally, serve with Honey Butter, Cinnamon-Sugar Butter, or Vanilla Browned Butter Glaze. Bread will keep airtight at room temperature for up to 1 week, or in the freezer for up to 6 months.